The Gemini Jets Plastic Premiere series offers customers with the option of a high-end, detailed plastic model at an affordable price. Each model features rolling landing gear and professionally printed airline markings for added accuracy. The option is also given for displaying the model with the included display stand allowing for optimised presentation. With Australia’s largest range of diecast scaled aircraft models, Collectable Aircraft Wings Australia is your number one supplier of the Gemini Jets Plastic Premiere series. Offering an industry leading pre-order and ordering system enabling our customers to order their favourite Gemini Jets Plastic Premiere models in just a few easy clicks! 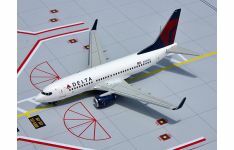 Product Description: Airline: Delta Air Lines Aircraft Type: Boeing B737-700w ..